Text Your opponent cannot Tribute this face-up card on the field, and cannot target it with card effects. You can only use each of these effects of "Darkest Diabolos, Lord of the Lair" once per turn. 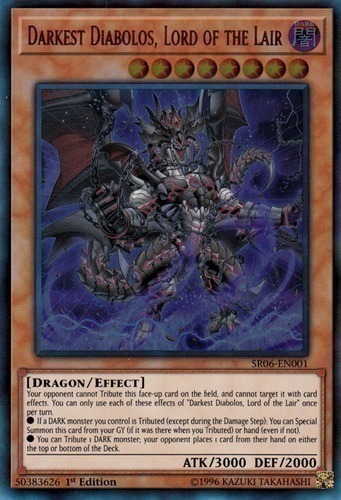 ● If a DARK monster you control is Tributed (except during the Damage Step): You can Special Summon this card from your GY (if it was there when you Tributed) or hand (even if not). ● You can Tribute 1 DARK monster; your opponent places 1 card from their hand on either the top or bottom of the Deck.